We are moving the entire site to this location, so please bare with us for now. To summarise the reasons:- I have not been able to keep up with the costs of my hosting as well as the domain name. While it may seem cheap with all the deals that are available these days to own a domain and free unlimited hosting, I have been with them for some time so the costs have mounted up. For the time being this place seems the best option as it allows us to use ads to help recover some costs. I would have used WordPress.com but unfortunately they do not allow basic users to put their own ads code on the blogs. Please use the navigation menu on top to find what you are looking for. Just a small update, I have been busy recently (primarily with Dark Souls 2).. Hence have not had time to work on any themes. Have got some ideas for a new theme so can expect something fairly soon. On a side note, if you haven't checked out Dark Souls 2 yet, I highly recommend that you do check it out. Its one of the greatest games to come out this year! A simple and light WordPress theme. Perfect for professional bloggers who like to blog with ease. 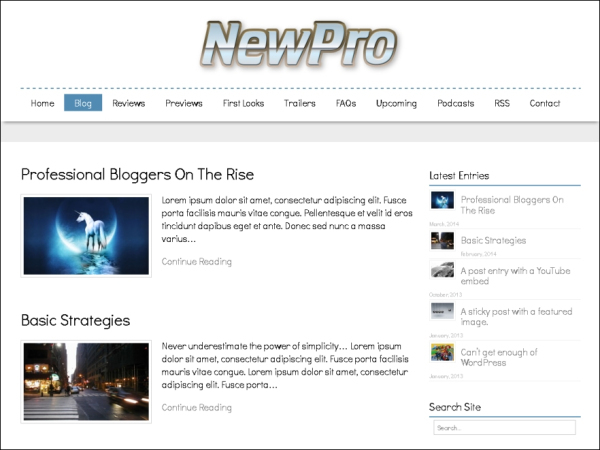 NewPro was built with the ‘professional blogger’ in mind and offers all the standard requirements that a blogger might have. Light design with a traditional and simple layout. Featured image – Left aligned on main page. Full width on single post views. Custom Logo option – Theme supports the upload of a custom logo that will replace the default site title. Custom Background option – Theme supports background color changes and a background image. Outside the wrapper, the colors can be changed using the color picker in the ‘Customize’ area. A background image can also be uploaded which can be fixed or scroll-able. Extra Navigation menu – A top menu can also be added in the menu section, go to Dashboard -> Appearance -> Menus. Custom Font – Thanks to the availability of free fonts, this theme features a neat custom font for all the text. Footer widgets – Add 3 sets of widgets at the bottom of the page. 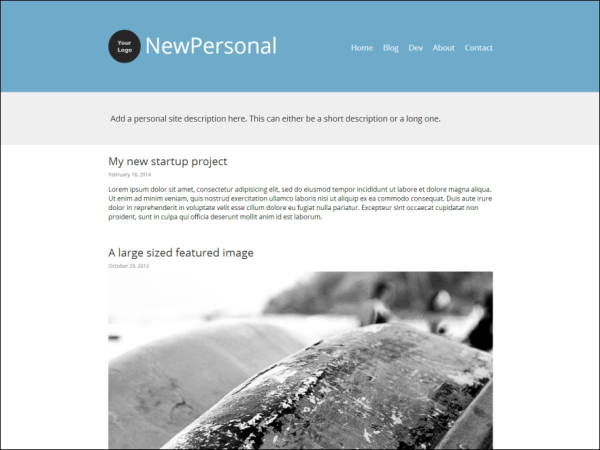 A simple, light and professional WordPress theme. Perfect for professional bloggers who like using a stylish layout with a left sidebar. Features:- Left sidebar, Full width featured images, Custom background, Custom logo, Footer widgets, and Neat typography. 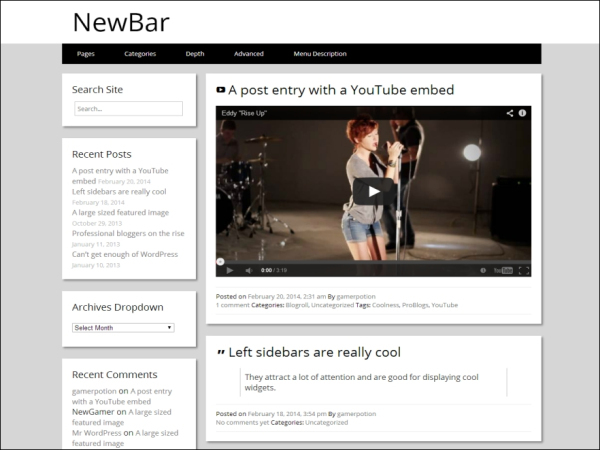 NewBar uses NewTek theme as a base. Light design with a simplistic layout. Featured image – large centered image. Custom Logo option – Theme supports the upload of a custom logo to replace the default site text and description. Suggested dimensions are 300 x 80. Return to top link in the footer. A simple and light WordPress theme. Perfect for personal blogs or development sites. Created with ‘personal’ sites in mind, now you can have your very own personal styled blog. 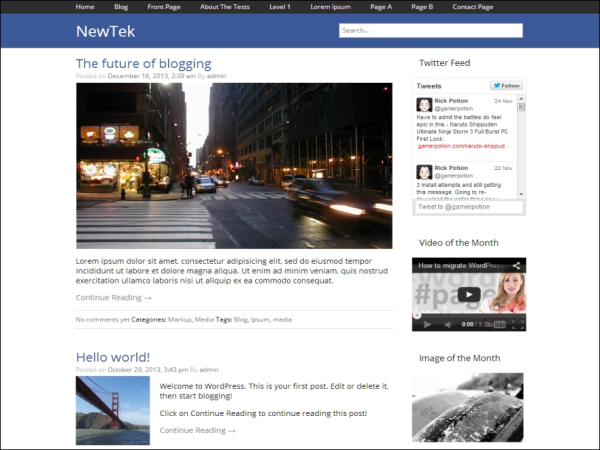 NewPersonal uses NewTek theme as a base. Featured image – 950 x 534 large image. Great for photos or screenshots. Custom Logo option – Theme supports the upload of a custom logo to replace the default logo. Recommended dimensions are 80 x 80. The logo can also be removed to just show the site title text. Single post widgets – Add widgets to the right sidebar in single post views. 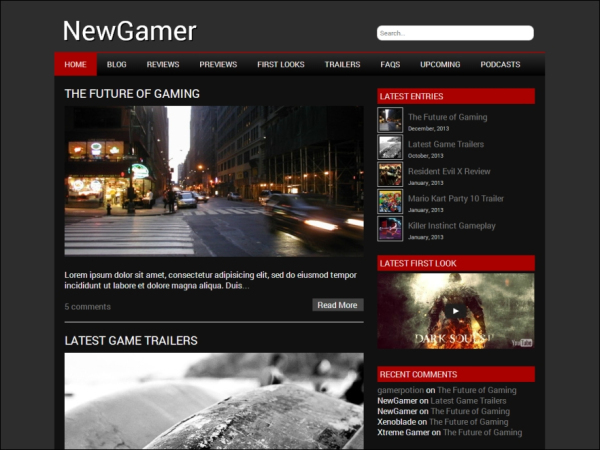 NewGamer – A Gaming focused WordPress theme, styled in dark and neat colors. Perfect for Video Game and Entertainment websites. This theme has been specifically styled in colors and a layout that would suit any gaming website. Dark and Neat colors – Perfect for gaming and entertainment websites. Featured image – Full size featured images. Custom Logo option – Theme supports the upload of a custom logo to replace the default site text. Suggested logo dimensions are 300 x 80. A content-rich theme. Perfect for bloggers and magazine sites who wish to display extra content. This theme, like WordPress, is licensed under the GPL. Magazine style layout with 3 columns. Adaptable design – Don’t like 3 columns? No problem! just empty out the widgets in a specific sidebar and that entire sidebar will be hidden (making the content to fill the gap). 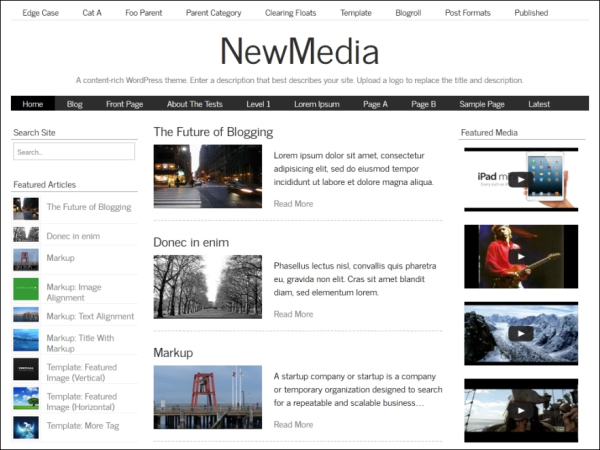 This means you can even choose a regular left sidebar or right sidebar blog layout. Featured image – Left-aligned on main page, then enlarged on single post views. Custom Logo option – Theme supports the upload of a custom logo to replace the default site text and description. Suggested dimensions are 960 x 200. 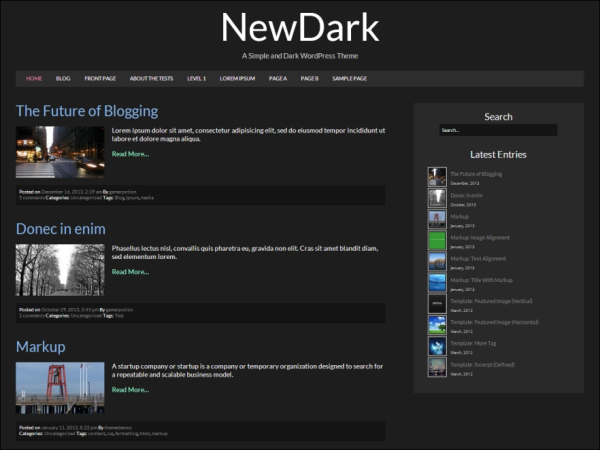 Using our NewTek theme as a base, NewDark features a blog-styled design in dark colors. Perfect for bloggers who like a darker layout. Dark design with a simplistic layout. We are pleased to announce our first public release NewTek. Theme created by Gamer Potion. A simple and light WordPress theme. Great for blogging. Ideal for technical, photography, gaming, and entertainment blogs. This theme, like WordPress, is licensed under the GPL. Featured image – 640 x 360 centered image. Great for photos or posters. Custom Logo option – Theme supports the upload of a custom logo to replace the default site text and description. Suggested dimensions are 300 x 50.